Bags of potential for both guitarists and singers, and in typical TC-Helicon style, it sounds superb. Masses of live performance capability packed into one product. Fantastic sound quality. Basic EQ. Usage dependent on placement and size of gig. 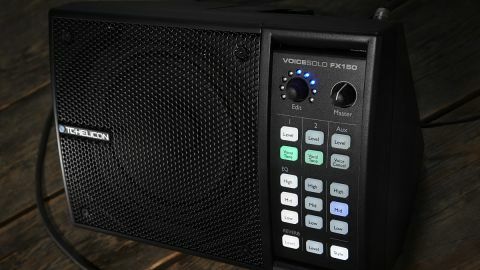 It might be called a VoiceSolo but it's the "all-in-one personal PA, vocal monitor, instrument amplifier and vocal reverb unit" bit that should interest performing acoustic guitar players. With a face not much bigger than an iPad, the wedge enclosure is rigid and lightweight (3kg) with a full-range 6.5-inch Tannoy two-way coaxial ICT Driver and 150 watts of Class-D power. You can use it, via two neat rear clips, on a music or mic (adaptor supplied), table or floor. There are two channels (with combi jack/XLR inputs), plus a third auxiliary with mini-jack input for your mp3. That third channel has a Voice Cancel feature for vocal practice; the main two have a Vocal Tone preset (EQ, compression and de-essing). Each channel has three-band EQ; channels one and two have reverb. Output can be wet with effects (and full or channel one-only output selection) or dry if you're plugging into a bigger system. There's phantom power and a USB port, too, plus optional carry bag. It's extremely easy to use, and with surprising low end, you could easily use it as sound reinforcement in a small room. As an acoustic amp the EQ is a little basic, but if you already have onboard EQ, it's up to the job giving you a personal mix while you can connect into a bigger PA as you need.